Here’s a straightforward SQL statement that allows one table to easily be duplicated in MySQL without affecting the existing table. The below SQL makes a copy of the existing table structure (without the data), preserving all field names and indexes. There are a number of reasons you might want to duplicate a table in MySQL. For example, if you want to make a copy of the table for testing or development purposes, without interfering with the live table. If you’re using PHPMyAdmin, duplicating tables is really easy. 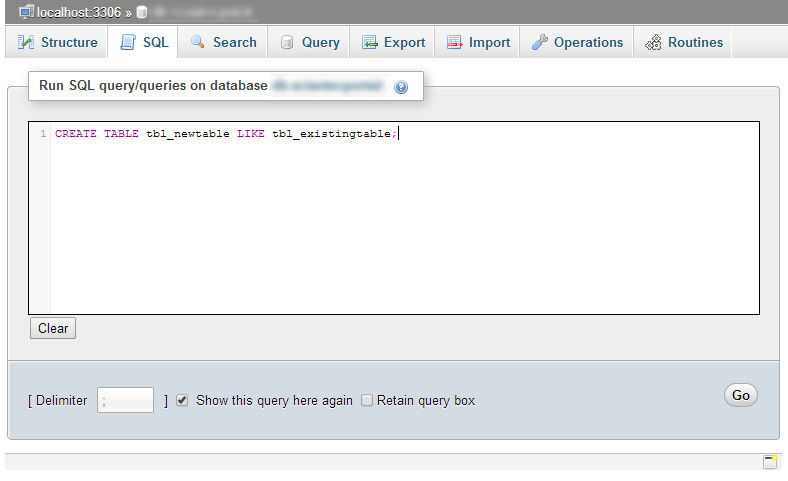 Under the ‘SQL’ tab for the selected database, just copy and paste the SQL above substituting in the new and existing table names.